Can underwater robots catch the imagination of middle and high school students and spark an interest in science, technology, engineering and mathematics? Researchers and educators from the University of Georgia’s Skidaway Institute of Oceanography and Marine Extension (MAREX) think so. They are creating an education program focused on autonomous underwater vehicles (AUVs), also called gliders or underwater robots. The program, “Choose Your Own Adventure,” will capitalize on Skidaway Institute’s expertise with AUVs and MAREX’s extensive history of marine education. Skidaway Institute scientist and UGA faculty member Catherine Edwards, and MAREX faculty members Mary Sweeney-Reeves and Mare Timmons will direct the one-year project. 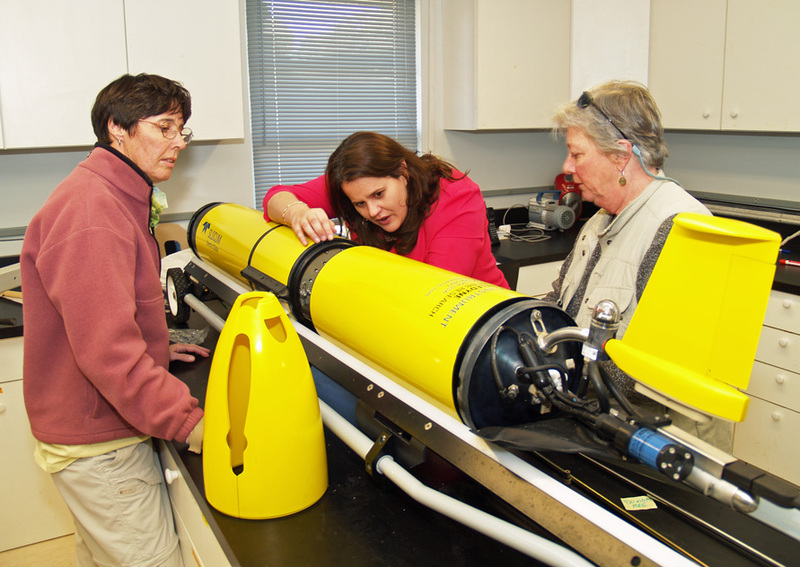 Catherine Edwards (center) demonstrates an AUV to Mary Sweeney-Reeves (left) and Mare Timmons. The AUVs are a cutting-edge technology in marine research. The torpedo-shaped vehicles can be equipped with sensors and recorders to collect observations under all conditions. They are launched into the ocean and move through the water by adjusting their buoyancy and pitch. Because they are highly energy-efficient, gliders can remain on a mission for weeks at a time. Every four to six hours over their mission, they surface, report their data by satellite phone and receive instructions as needed. Skidaway Institute’s AUV, nicknamed “Modena,” has been used in several recent projects, including “Gliderpalooza,” a simultaneous, cooperative launch of 13 AUVs from different institutions in 2013. The proposed work will highlight the problem of working with the strong tides that are characteristic of the Georgia coast. A big issue in operating gliders there is developing a guidance and navigation system that will function well in that kind of environment. The fast-moving Gulf Stream, located roughly 100 miles off the Georgia beaches, also introduces navigation problems. “Although the AUVs have Global Positioning Systems and can be programmed to travel a set course, tidal and Gulf Stream currents can exceed the glider’s forward speed, which can take the instrument off course and keep us from collecting data where we need it,” Edwards said. However, on the education side, the predictability of tides makes the proposed program highly intuitive and education-friendly. Activities will depend on grade level so middle school students will have different objectives than those in high school. However, all the activities will address the direction and speed the AUV travels to a destination. The AUV direction and speed will depend on the sea state of coastal waters such as strong currents, storms or high winds. To address the problem of strong tides, Edwards and a team of Georgia Tech graduate students, co-advised by Fumin Zhang, have developed the Glider Environmental Network Information System, called GENIoS, which optimizes a glider’s path based on data from real-time observations and ocean models. Current doctoral students Dongsik Chang and Sungjin Cho are working to upgrade the system to integrate real-time maps of surface currents measured by Skidaway Institute radar systems. The education plan is to involve two local educators, April Meeks and Ben Wells, who teach in the Savannah-Chatham County Public School System. Since the activities are multidisciplinary, their expertise in building math curriculum will be valuable as the team integrates concepts of marine science, math and engineering into classroom activities. “After the initial planning phase, we will be taking the program on the road to Chatham County schools,” said Sweeney-Reeves. Activities will include student role-playing as an AUV maneuvers through a playing field of vector currents on a large game board. Successful arrival at their destination depends on how the individual pilot responds to currents, wind and density changes in route. “The real fun will begin when obstacles, like underwater volcanoes, a giant squid or other surprises, cause the pilot to reroute the course of the AUV,” said Sweeney-Reeves. The activities will allow students to develop analytical skills in a program that will be compliant with Next Generation Science Standards for the 21st Century in the common core state curriculum. The funded study will include two short glider deployments. A summer 2014 deployment will be used for field-testing, software validation and developing real-world scenarios for the outreach program. A fall deployment will serve as an opportunity for classroom participants to communicate with the glider in real time. The program is being funded through a joint grant from Skidaway Institute, UGA Public Service and Outreach, and the UGA President’s Venture Fund. The UGA President’s Venture Fund is intended to assist with significant funding challenges or opportunities. The fund also supports small programs and projects in amounts typically ranging from $500 to $5,000.